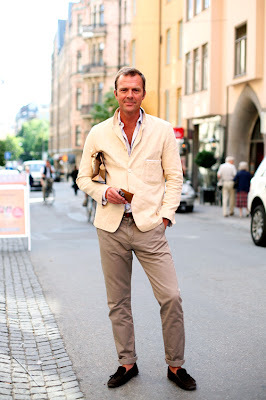 Comments on "On The Street......So Well Done, Ostermalm, Stockholm"
the clothes look good on him, and make him seem a bit younger than he is, a very calm summer look. I love the whole thing--shirt, jacket , pants, shoes. I agree to Carolina; Fantastic! That's exactly what I want to look like when I grow old(er). this is a"preppy" assemble that exudes sophistication in its simplicity. It is not infantile or uniform like -the way many read this "style"-. Yeah, scandinavians have a sense for simple elegance. Please don't embroid pineapples (or any other fruit plants or animals) in your pants ...please. A cool look.The shortish jacket makes it more interesting.If he insists not wearing socks,the shoes should be some other color-maybe a color nearer to this pants. This man is absolutely crisp & classic. I esp. like the slimmer leg on his khakis. The oddly low breast pocket on his jacket is intriguing. I also love the colour of the jacket. I'm not sure about the moccasins, but then I seem to have something against slipper-like shoes on men. The confidence that he emits is amazing! now this is what its all about! looking good and feeling good. You see it in his face! Very nice, but i dont like the shoes. Yes! If he asked me out for lunch or dinner, it's a yes! his clothes match his persona perfectly. fantastic. Generally, yes. Always have trouble with the belt-buckle reveal; the eye is drawn to that which it shouldn't be. And I'd ditch the low decolletage, which, with anything dressy makes the wearer look un-classy. The rolled pant cuffs say "Trying too hard" and/or "Too lazy to hem for Thom"
Then again, I'm wearing sweatpants with the word "GEEK" etched across the buttocks right now, so I'm arbiter of style. Excellent outfit. It all works together so well and, as many have said, his confident personality comes right through. Good picture Sart. I love the details of the jacket (like the buttons and collar) and the overall nonchalance of his stature and his outfit, yet at the same time he looks put very put together. Also, I love his soft-but-not-pastel color palette. He doesn't try to look younger than he is yet he looks very hip. Very debonair. Do you think he arranged for the buildings to be painted to match the jacket? Very handsome. Stockholm is great but when are you coming back to New YorK??? He looks so cool and relaxed - the kind of man to take you around the city for a walk, then lunch at an outdoor place in the warm late summer sunshine ... So handsome too. Now I know why I like Swedish men so much! Men in Stockholm are like a different species when compared to Finnish males; the Swedes seem to have an inborn sense of style, whereas the men in Finland just won´t bother. What kind of shoes does her wear? Tod's? Does anbody knows? First - I think he looks great, all around. Butch - are you using the term "low decolletage" to refer to his unbuttoned shirt? pretentious much? And why do so many people on this site play the game of trying to guess the brands? I feel like I'm back in my old deadhead days, when people would take pride in naming this tune in 3 notes. What does it matter if his shoes are TOD's? What a man! This is the look I want when I do get that old, he must be nearly 60 or so. But very cool look. My kind of man. Perfect. More like him please. i love his expression!! the coffee colours really suit him! is he not wearing underwear?? This is stylist and ex ex ex model Lalle Johnson, always impeccable and also the nicest person. One of the best dressed people in Stockholm. Everything is perfect here. He's dressed up but totally casual with the open collar. He has nice shoes sans socks. He is tan and has a naught smirk on his face. i think his pants are too tight around the boys. All in all casual sofistication. This is a very cute look for this man. the rolled-up trousers - to a perfect length, may I add - give him that "sprezzatura" we should all be after. To me it's what gives the nonchalance to this look. Notice that if the trousers weren't so perfectly tapered and narrow, the roll-up wouldn't work. Love the shoes too. A look executed to perfection, and then some.